A style icon and international status symbol, the Mercedes-Benz S-Class has long been a force to be reckoned with in the full-size luxury sedan segment. 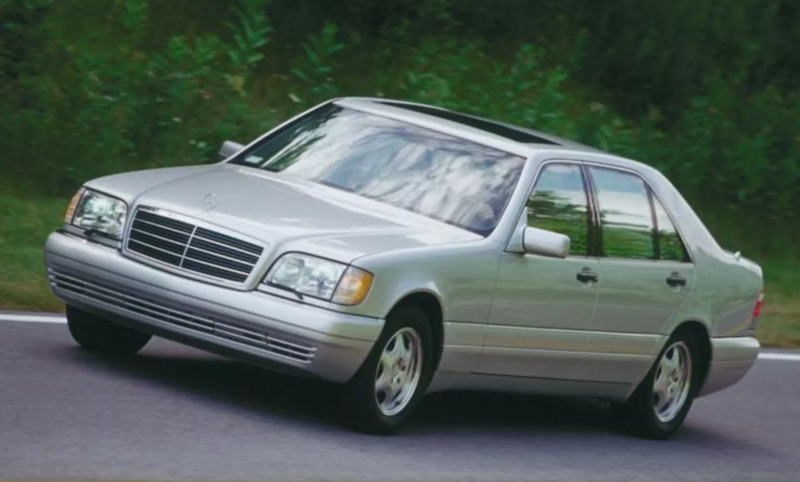 Today we’ll look back at four generations of the S-Class, starting with the 1992-1999 third-generation S-Class, known as W140, and ending with the current S-Class, the W222, which was introduced in the U.S. for model year 2014. Often referred to as “over-engineered” this generation S-Class was clearly synthesized during the decadent 80’s. It launched after years of delays amid a global recession in the 90’s and was perceived as overly complex. The W140 was too late in its development stages when the extraordinary 1989 Lexus LS hit the market costing tens of thousands of dollars less, so upon its arrival the W140’s value proposition was called into question. In terms of styling the W140 took the elegant and imposing lines of the previous generation and essentially super-sized them. Trapezoidal tail lights were joined by a decorative horizonal strip along the truck opening. The A- and D-pillars were both sharply angled and the bodysides were intersected with decorate color-coded plastic trim on early models and with bodycolor paint below a scuff guard on later versions. The no-nonsense interior was beautifully constructed and classically Teutonic, but did not move the style needle forward much, as it was essentially an update on the prior generation. The overall effect was imposing and solemn, the W140 S-Class was a big and serious looking vehicle, both inside and out. Holding a place in the ultra-luxury sphere, the 1992 S-Class has a starting MSRP of $69,400, a staggering $25,100 more than the 1992 Lexus LS’s starting MSRP of $44,300. Lightness would come in the form of the fourth-generation S-Class, known as W220, which was introduced for the 2000 model year and sold through 2006. Physically and stylistically less heavy than its predecessor, sweeping lines and sculpted bodysides replaces the slab-sided and boxy aesthetic of old. The S-Class’s dimensions also downsized slightly during this generation, although interior space increased due to creative packaging. Ovoid headlamps echoed the E-Class and Maybach concept car and the tail lamps had more style flourishes than the staid previous generation. Sweeping changes came to the interior as well. Described as “Italianate”, generously applied wood trim enveloped the cabin and circular lines replaced squared-off shapes and this was the first S-Class to feature an integrated navigation system. The W220 was a big leap forward in terms of style, however quality suffered as the automaker sought to achieve cost savings to better compete with the Lexus LS. The 2000 S-Class had a starting MSRP of $69,700 for the V-8 S430, down from an MSRP of $73,900 for the equivalent 1999 S420, opening up accessibility and leading to this generation being the best-selling S-Class to date. For comparison, by 2000 the Lexus LS400 MSRP has risen to $54,005, narrowing the price gap to $15,695. Marking a return to its boxy and imposing roots, the fifth-generation S-Class, known as W220, picked up styling cues, especially in the rear, from the Maybach. It looked more substantial both inside and out than the previous generation, with increased dimensions and a noticeably taller trunk line. Higher quality materials lined the interior which featured a layered and more complex design, and enhanced infotainment capabilities. Readily available AMG packages saw many S-Classes of this generation outfitted with aprons and large AMG wheels, which sat in juxtaposition to the formal lines. This shook off some of the design elements seem on the prior generation to adopt a more serve and brooding look, especially noticeable with the exaggerating rear wheel arches and sharply curved headlamps. Deploying the mid-size E-Class to battle it out with Lexus, this generation S-Class had a significant increase in its starting MSRP, jumping $15,700 from the 2000 model year MSRP to a starting price of $85,400 in 2007. The large price increase curtailed accessibility and reinforced S-Class exclusivity and pushing it well beyond the 2007 Lexus LS’s MSRP of $61,000 and creating a $24,400 gap between the models. Smoothing out some of the harshness of the (*), the **** generation S-Class was introduced for model year ***** and is currently in production. This was more of an evolutionary design that is distinguished by downsized tail lamps which appear better integrated into the sheet metal, a graceful character line with scalloping along the doors replacing, toned down wheel arches and a softer contouring of the head lamp fixtures, which now incorporate three rows of LED daytime running lights. Inside, a large infotainment screen dominates the dash and is connected to the instrument panel. The blocky design found in the previous generation made way for more organic forms along the door panels and console and ornate speaker grilles became a design signature introduced on the S-Class that would make its way throughout the Mercedes-Benz range. The 2015 S-Class carried a starting MSRP of $92,900, a $7,500 increase over the 2007 W220’s starting price. Meanwhile, the 2015 Lexus LS’s pricing $75,465, leading to a price gap of $17,436 between the two models.